Does anyone have a "go-to" or favorite summer style extract kit? Would like to get something going in time to be ready by the 4th of July. Then Id like to add some orange and lemon zest. obviously to everyone their own, but I am a fan of SN clones or APAs for summer time. I've been reading up on this and have considered taking the plunge; however, I am more looking at going the route of ciders and meads before going for full beers. One reason is I have heard ciders and meads are "easier", the other being that when I start brewing beers, I'm going to look at making ones that are gluten-free . Have any of you done ciders or meads and, if so, what has been your experience. I have two Meads going right now. Easiest process in the world. You need a good supplier of honey. No cook process at all. Add Honey and Water, mix, add some wine yeast + nutrient and wait.....a really long time. I'm in secondary right now for about 3 months. Need to bottle and will crack open in the fall. 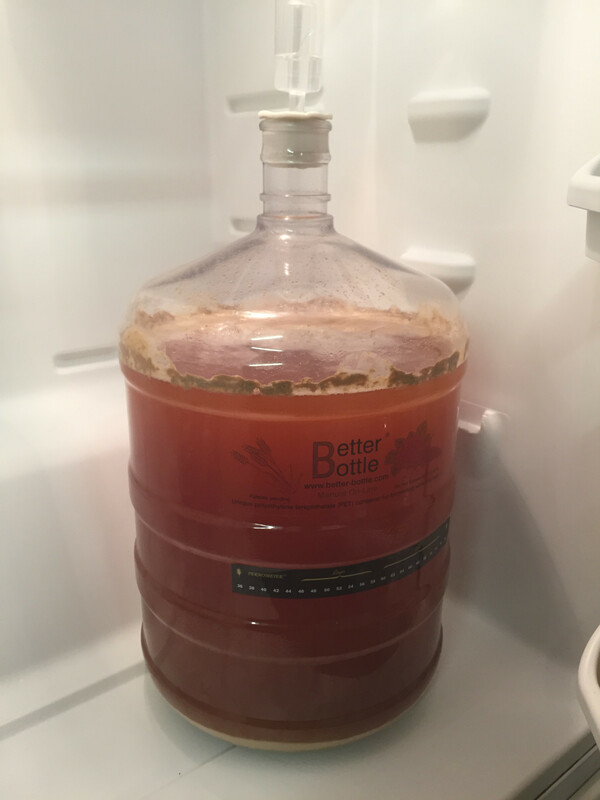 Thoughts on secondary fermenting? I mostly brew ales and have always used a glass carboy secondary. I have never had any problems except one batch was bad but I have no idea why. I always read that doing secondary fermenting is not recommended unless you are dry hopping or brewing a beer that recommends it. I was going to try my next brew without using a secondary just to see how it turns out. I am worried about it sitting on the yeast cake/trub too long and affecting the flavor. Since this I am going for a crisp clean summer ale, I am also worried about it not being very clear. While I am here, here is my last brew, an IPA that was seriously delicious. Are you going to add more yeast to make it "sparkling", or are you leaving it as is? Also, what types/varieties of honey have you used? This is definitely a YMMV topic. IMO, it depends on how long you are planning on cold conditioning. If you use good sanitation practices, I always think a secondary is a good thing. For example, if you are planning on conditioning for a long time (eg, for styles that rely on brilliance), I would recommend a secondary. If I have to wait that long, I don't want to risk any weird flavors developing sitting on trub/yeast cake. Most people that I KNOW that steer clear of secondary, do so for two reasons. 1) possible infection from poor sanitation and 2) aeration/oxidation (which can lead to a cardboard-ish flavor). If you are careful, you can easily avoid or mitigate both. On a personal note, I ALWAYS secondary. I sometimes even filter. But I also recognize, I am probably the odd man out on this topic. I want as little yeast cake in my keg as I can get. I hate the unfiltered craft beer farts. Secondary 'fermentation' is one of those divisive topics in homebrewing where everyone has a different opinion. For me it varies by batch and what I'm trying to accomplish. 1) I am adding dry hops or other ingredient infusions (fruits, spices, etc.). Even then, sometimes I will just throw them in the primary. I'd say I secondary on about 50% of batches, but for example my last batch of ESB I did not secondary, and even added an oz of EKG hops, and the beer turned out great and even had good clarity (see pic earlier in thread). I don't really buy the whole yeast cake imparts a negative flavor claim, unless you leave it on there for months. Yeast is your friend and can help clean up off flavors like DMS with a little extra time after primary fermentation is complete. Given that you want a crisp, clean summer ale, and I would imagine you would want some clarity, I would recommended primary for 2-3 weeks, secondary cold crash for 2. I have a question on cold crashing. I know you're supposed to move it to a fridge for 2-7 days, but does the movement and stirring up of the sediment defeat the purpose or does it have plenty of time to settle back down while cold crashing? I use whirlfloc tablets, so will cold crashing help any more? I've always transferred to a secondary for clarity reasons, but might stop since I don't brew complex or heavy beers. Just transfer it as carefully as possible to your fridge and a week should be plenty of time. I'm lucky in that I have a temp controlled chest freezer so I simply have to hit a few buttons. I would still cold crash even with Whirlfloc (I do this) as it will help with the clarifying process more. I've produced some crystal clear beers with Whirlfloc and cold crashing. I'm thinking about taking a shot at brewing a Gose. I've never done anything sour as I have read that it pretty much renders any equipment useless for anything but sours. Is there any truth to this? yes. I avoid bacterial infected beers for this reason. Really hard to get out of your equipment. I bottled up my American sweet stout from a couple of pages ago. Looked and smelled nicely. No tasting yet. I always like to let it "calm down" in bottles before tasting. I will post photos and my BJCP reviews from tonight. I've used two different honeys. One from a local farm, that is mainly clover. The other I ordered from Amazon and it was Orange Blossom. These are not sparkling meads. I just bottled them last weekend. I need some help. I brewed a summer ale last Friday and used Safale US-05 yeast (64-72 fermentation temp range). Since the house temperature fluctuates so much in the summer (OG&E Smart Hours), I used our outdoor fridge and initially set the temp at 66. I saw a little bit of action in the air locker, but not much in the carboy. After a day or two I thought that it may be too cold, so I raised the temp a couple degrees and then a couple more thinking that the yeast may be asleep. As of now, the temp is at 70 and here is what the carboy looks like. The trub has fallen to the bottom and there is some of the normal residue at the top, so I guess it's done, but I've never see so little activity before. From the pic, does it look like it has fermented? I know I should just take a FG reading to be sure. FG is the best way to be sure. Based on your description, it has been fermenting around mid 60sF (creeping up at the end) for about 5 days right? My guess is that your initial strong fermentation is done. However, I will almost guarantee you, it is still fermenting right now, despite your lack of activity signs. From the photo, it looks like a lot of yeast is still in suspension and hasn't floc'ed out, so I would guess it is still going. I've had some that blew up in the first two days, and then do visibly nothing for the remainder of my schedule. I've had some that lagged, and then got going, and then some that were like bubbling clocks. Yes, it has been in the 66-70 degree range for 5 days now. I used to transfer to a secondary and used a bucket as my primary. Of course I never got to see what was going on inside until everything was done. I have done away with using a secondary and this is my second batch in only a carboy. My last brew was a Kolsch and it looked like a tornado was going on inside during fermentation which this one did not at all. I guess I will take a reading in a day or two and see where the gravity falls. BTW, I am planning on leaving it in the primary/fridge for three weeks. I think this is a good plan. Remember that the fermentation is exothermic. Just because your fridge temp is set at 65F, doesn't mean your ferment in the carboy is at that temp. Odds are, it is a LOT warmer, and possibly why it looks like it may have finished up fast. As you get toward the back end of that fermenation schedule, I would start crashing your fridge down to the 50s if you can. Your yeast should be done, and you should be able to get a lot of it to drop out. Actually, after you get your gravity reading, if it is close, I would crash it down right then. Well, the FG was perfect (1.012). Whew! So you recommend cold crashing for a couple weeks rather than just a day or two before kegging? Well that all depends on the style and how clear you want it. If the style calls for brilliant clarity, I would definitely cold crash it for a while, and damn near lager it. Since you are kegging, I would assume you're not going to be natural carbing, so no need to keep yeast in suspension. On the other hand, if your style is cloudy, don't cold condition, you need that yeast in there. If you have more money than sense, get a plate filter and filter the damn thing.